The Canadian Orienteering Federation has re-established the High Performance Program, or HPP in short, starting this year. 24 athletes, junior and senior, have joined the group with a focus to improve Team Canada results at international orienteering events in the coming years. The athletes' names are listed below on the left. The program is trying to create a team spirit, despite athletes being spread geographically. Everyone is encouraged to share training logs online, to take part in online meetings and to join training camps and races. Major international events that Team Canada athletes are preparing for this year include, World University Championships, Junior World Championships and World Championships. 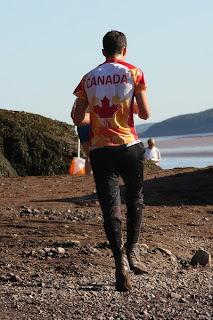 A goal of the program is to raise the profile of elite orienteering in Canada and one communication channel is this blog. The HPP will work towards an active posting schedule throughout the year, with training updates and reports from big races. Hope you will enjoy to follow the progress of our elite athletes!